Gustave Eiffel built the tower that bears his name in 1889, and it has become the symbol for Paris. Time will tell if Remington’s “R” will become as iconic as the Eiffel Tower, but this vibrant, diverse, changing, and energetic neighborhood now enjoys a major piece of outdoor art. Designed by Remington’s Dominic Terlizzi—a professional artist, professor at Towson University and the Maryland Institute College of Art and soon-to-be Artist in Residence at the University of Tennessee—Remington’s ‘R’ was fabricated by New Arts Foundry in Hampden. Remington was the beneficiary of a PNC Bank transformative art grant, administered by Baltimore Office of Promotion & the Arts. The grant came with the stipulation that funds would go to art projects that benefited the community only; this effort was for art, and for art’s sake. The project started in February 2013, after residents expended many hours researching how Remington could benefit from such a grant. Those who initiated this grant proposal sacrificed sleep and met often before they went off to their jobs for the day or after work. Their efforts paid off. 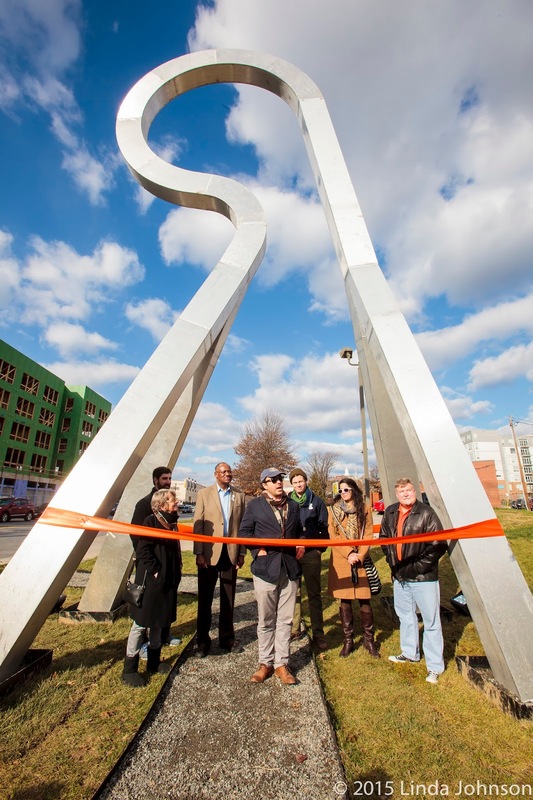 Remington received the full $30,000 grant and the “R” transformed from a sketch to a 35-foot aluminum sculpture. The “R” has received a largely positive reaction. But like all public art, it has also drawn criticism. "It's not for us, it's for people who don't live here yet," one 27th Street resident says. "Once my house becomes a high rise loft or a fancy shop it will make sense." For more than a year, the “R” sat forlorn in nearly unidentifiable pieces in a warehouse while its space, and fate, was being decided. The sculpture was originally planned as a gateway to Remington from the south on Howard Street, in the traffic island at Howard and W. 26th Street. Problems with that location put the sculpture in limbo until it found a home on the corner of 27th Street and Remington Avenue. Seawall Development paid for installation, provided the land, and supported the project throughout its journey. Now the “R” has risen, and a walking path winds at its feet. And Remington gets to decide what this bold symbol will mean to the community. What is the exact location of this aluminum sculpture? 2700 Block of Remington Avenue in front of the 7-11 that is perpetually robbed.